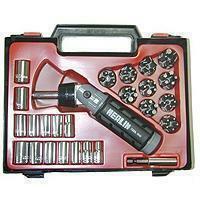 Screwdriver Kits| Hand Tools | Meeng Gang Enterprise Co., Ltd. The screwdriver kits completed with rubber handle are available in different types of Phillips and slotted screwdriver bits to meet drilling accessories applications. As a Taiwan-based supplier, Meeng Gang is famous for producing various hand tools worldwide. We provide complete screwdriver sets including a two double-ended screwdriver bits, a typical slotted bit and a Phillips bit, bushing and tube. With our wide selection of sets that you can install them into a wooden handle for your needs. The main products in inventory are ratchet screwdriver, drill bits, screwdriver kits, power screwdriver bits, screwdriver bits and more accessories for power tools and air tools. Our products receive TUV standard verification as well as ISO 9001:2008 certification. Further, our product specialists have more than 39 years of rich experience and all of our production go through rigorous testing to make sure the goods quality. A world well-known manufacturer of professional hand tools, Meeng Gang, provides the high quality screwdriver kits to national and worldwide clients. Please see the specifications below for the details of our screwdriver sets. If you have interested of our item, please feel free to contact us today for additional details. We will be here as always do to help your needs! Contents: 1pc RH2 Short Shaft Ratchet Screwdriver + 50pcs 25mm Sand Blasted Bits + 12pcs Sockets + 1pc Bits Holder.